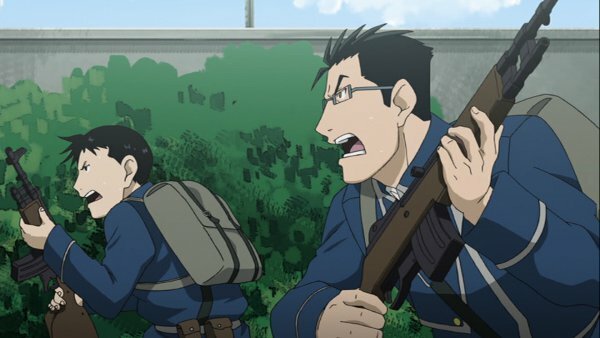 There has certainly been a lot of Fullmetal Alchemist: Brotherhood lately, with one shot sets being released before each of the two collections of the series proper. So, with The Sacred Star of Milos, reviewed HERE, and Collection 1 having been released already it is now time for the OVA Collection before the release of Collection 2. 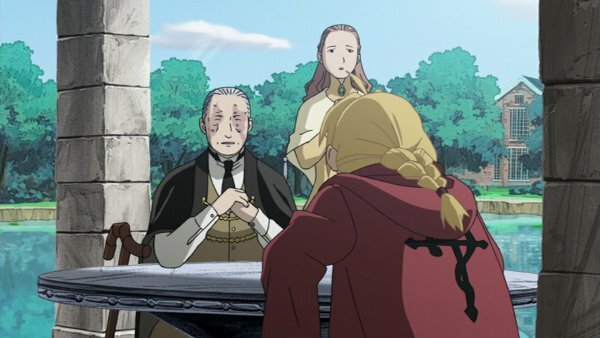 Fullmetal Alchemist: Brotherhood is a series with plenty of room for exploration, with plenty of side characters to choose from, so how do the OVAs handle such a wide cast to pick from? There are 4 OVAs that come in the collection, which all star different characters in the major role. The cover art is a bit misleading however seeing as it features Hohenheim and he doesn’t appear in any of the OVAs himself. But, they do at least work to focus on different characters in the different ones. The first OVA, “The Blind Alchemist”, is unfortunately probably the weakest of the 4, as it is focused on Ed and Al on a side investigation into human transmutation. This time around they are seeking out a blind alchemist who is reported to have successfully achieved it. The reason this is the weakest is that it is simply a side story that introduces new characters and doesn’t really explore anything new with the brothers, very similar to The Sacred Star of Milos, though much shorter. “Simple People” does a lot better in terms of what it brings to the viewer. This one focuses on both Winry and Lt. Hawkeye, though the brothers Elric do feature heavily in it. The OVA fills in a bit of the gap between flashbacks of the series and where it actually begins, to explore the changes between the Lt. and Winry from when they meet after the military first visits Ed after the incident. It’s much better in character exploration than “The Blind Alchemist”, but not quite the best of OVAs. 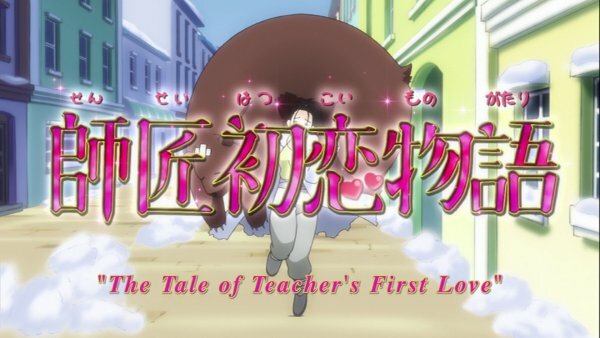 The next OVA is “The Tale of Teacher” and it actually provides a healthy backstory on one of the more interesting things only mentioned in the series. Going into just how Izumi Curtis, the Elric brother’s teacher, was able to survive alone on Mt. Briggs, unfortunately it does go very much like the brothers story in the series. However, there is a special bonus story after the credits that it probably the cutest thing Izumi has ever been in. 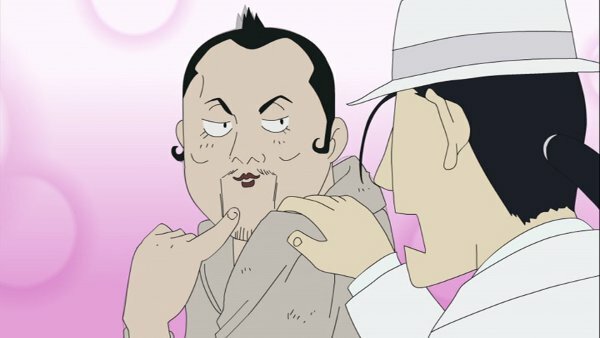 The final OVA, “Yet Another Man’s Battlefield”, focuses entirely on how Mustang and Hughes met and formed their friendship. This probably the best OVA of the bunch however as it gives the much needed exploration of Hughes that the series was deeply missing. It doesn’t quite make up for how little there was of Hughes though, but it definitely provides a better look at the man. The visuals of the OVAs themselves definitely match up to the visuals of the series, not suffering the same problems that The Sacred Star of Milos had in terms of quality. The art style is nice in that the backgrounds are very detailed, with the characters put in over top of these. Where some people might think this awkward, it really does provide a different aspect of the more animated characters moving around in a flatter, picturesque environment, that fits with the general themes of the shows, such as focusing on the characters more than actual location. The extras that come are considerably lower quality, but seeing as they are simply humorous and designed to look as such, they work for what they are. The art style is great for looking so much like a short one line comic, such as those in a daily newspaper. The drawing is quick and dirty, with a lot less time spent on the backgrounds and almost exclusively on the characters, which still look very quickly done. It’s definitely nothing to write home about, but as a whole shouldn’t ruin the experience of the extras, if it does you’re probably enjoying it wrong. There is a wide variety of music throughout the OVAs as they feature a fair number of characters, themes, and moods. Almost all the OVAs play the military chorus over the credits, while the first OVA has a slowly more melancholy music over the credits to fit the “lesson” that they learn, there is also different music for the credits of the bonus Izumi story that is light and all strings that caps off that mini-OVA very well. As for the music that plays during the OVAs stories, they all seem to fit their respective parts, i.e. very slow strings for building drama, etc. As per usual this release comes with both the English dub and the original Japanese dub, however in terms of voice acting, the English is simply just okay, but I found it much more preferable to simply read the subtitles and listen to the Japanese voice track instead of listening to Ed’s English voice work, which for whatever reason I find to be kind of grating. The rest of the English dub unfortunately falls kind of flat, it terms of fitting tension and drama the Japanese is probably the ideal way to go. 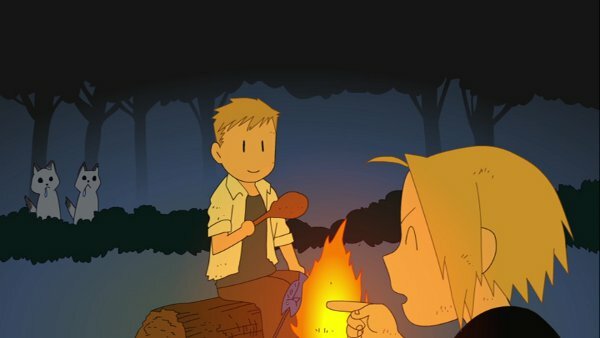 Although, in the episode of Fullmetal Four-Panel Comic Theater that features Ed and Al’s younger sister, the voice is perfectly cute in both versions, and while a joke would have been awesome to hear more of. The extras packed on the OVA Collection are a tad light, as the only real special feature is the 16 Fullmetal Four-Panel Comic Theater. This is pretty interesting to watch as they are mostly part of the story taken in aside and finding some aspect to make a joke out of. Watching all of it straight through follows the plot of the series in chronological order, so in some ways it can serve as a kinda of recap or refresher after being away from the series for a while. While not all the jokes are hilarious, they are worth the watch. Interestingly or not, depending on outlook, some of the jokes or dialogue change quite a bit depending on English or Japanese, which doesn’t mean it’s instantly something that should be watched twice to see both. There are only a few that change, the most obvious being Mustang’s answering machine. The range of characters featured in these episodes is far larger obviously, but also delves into more fan favorite characters, such as automail mechanic Garfiel from Rush valley. It’s really a grab bag of whatever could be poked at for fun throughout the series, from the complexities of the Bradley Family, to the varying explorations of Winry’s personality, to the homunculi, to the variety of Mustang’s men, it runs quite a gamut in terms of topics. 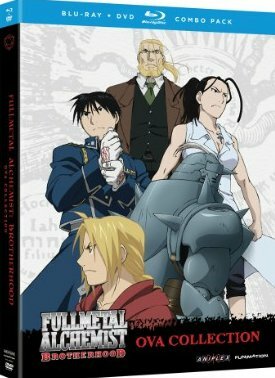 The Fullmetal Alchemist: Brotherhood OVA Collection does provide a solid addition to the the series in terms of character development and backstory, though it is kind of hard pressed in terms of actual content. Only 4 OVA episodes, with the only special features being the Fullmetal Four-Panel Comic Theater, there isn’t an over abundance of bang for the buck, but it does equate to about the length of a movie, so the price of a movie certainly fits. The music is good, the voice overs are solid, and the visuals deliver what one expects from the series. While there isn’t much content it is understandable what with all the other releases probably getting the major focus in terms of that, so content is solid enough.